Guess who dropped by on the sets of Salman Khan's Race 3? None other than our favourite Ranveer Singh. 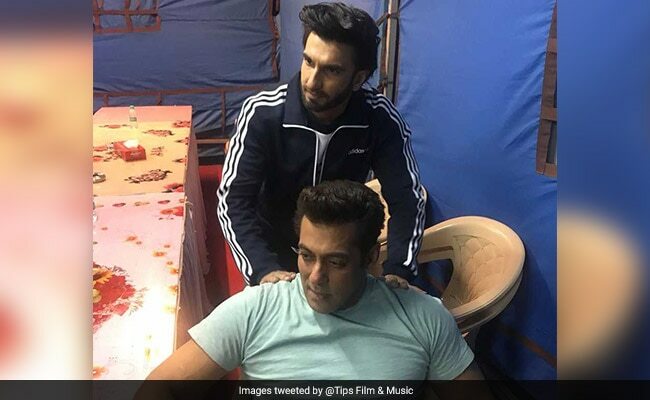 Yes, Ranveer visited Salman on the sets of his upcoming film and the two stars were photographed together ( can anything be better than this? ) Not only Ranveer visited Salman but he also gave him a stress relieving back massage. Well, "Ek Actor hi dusre Actor ka stress samaj sakta hai." Tips Film & Music official Twitter page shared a couple of pictures featuring Salman, Ranveer, director of Race 3 Remo D'Souza and producer Ramesh Taurani. In one of the pictures, the Padmavati star can be seen giving a back massage to Salman while in the other picture Team Race 3 and Ranveer posed for a perfect picture. The picture definitely delighted Ranveer and Salman's fans, who are hoping to see the two stars in a film, soon. One Twitter user wrote: "my favourites" (and we can't agree more) while the other wrote: "Hope to see double energy someday." Salman is currently awaiting the release of his upcoming film Tiger Zinda Hai, co-starring Katrina Kaif while he's prepping for a sequel to hit film Race. Ranveer Singh will be next seen in Padmavati, which was to release on December 1. The film's release has been indefinitely delayed because of the ongoing protests against the film by many Rajput groups, who claim that director Sanjay Leela Bhansali has distorted the facts. The new release date hasn't been announced yet.